Another Long Walk: Day 88: Just call me... Superman! 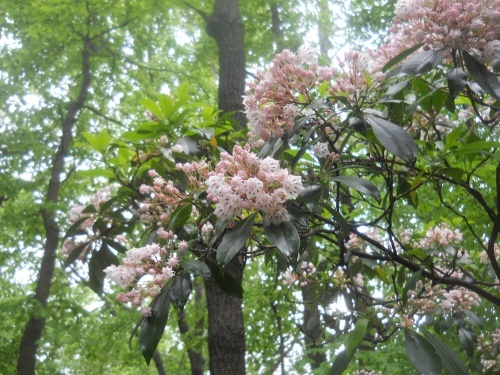 June 3: By morning, the rain had finally stopped. The skies were overcast, but I was just happy that the rain had finally stopped. 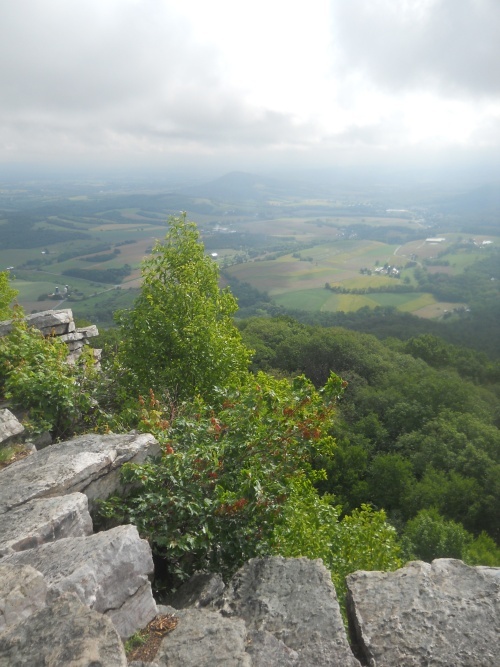 Pennsylvania is infamous for its rocks, often referred to disparagingly as "Rocksylvania." The truth isn't quite so clear-cut. The southern half of Pennsylvania is positively easy through rolling hills. 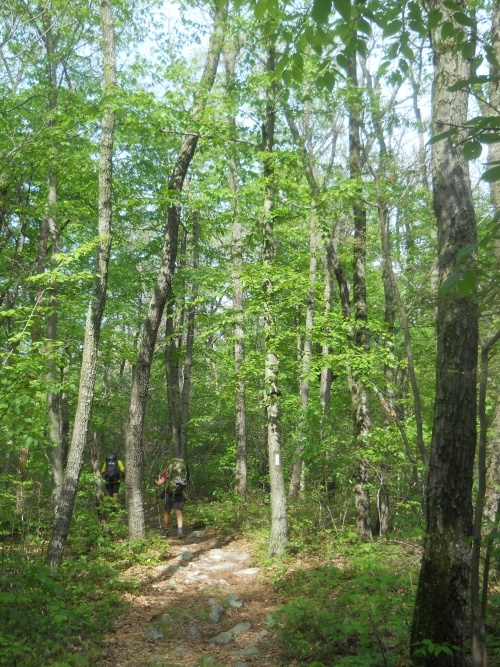 The northern half of the trail gets a lot more rocky, and there were a lot of them on the trail today. I didn't think it was too bad--not any worse than other parts of the trail we'd already done, but many of the other hikers complained bitterly about the rocks and struggled a lot more through them. I'm not really sure why the rocks didn't bother me so much. Maybe it's because I expected them or had a better idea of what was coming up and set my expectations accordingly, but all-in-all, I didn't think it was a big deal. The sections where the rocks genuinely were difficult and challenging tended to be very short and the trail would level out within a half hour. Eckville Shelter is worth pointing out because it's next to a house along a country road so it has all of the comforts of home. So I stopped a bit to snack, throw out my trash and recharged my smartphone. =) It was too early in the day for me to call it quits for the day, however, and I continued onward. The last noteworthy event of the day was Balancing Rock. 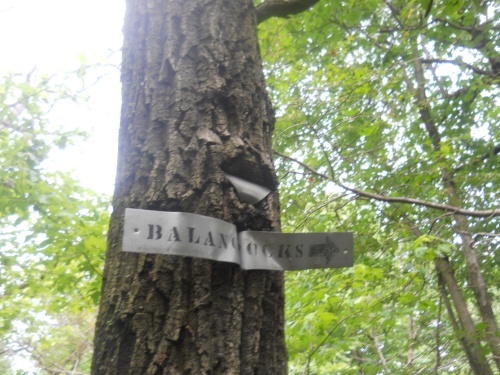 I didn't know anything about Balancing Rock until I saw a small, twisted sign pointing off trail in that direction. 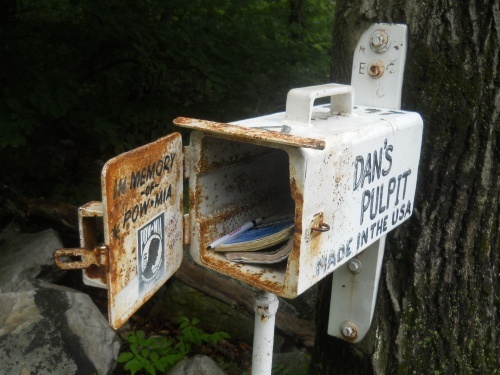 I didn't remember it from my first thru-hike, and it's not listed in my guidebook, so it really was a complete surprise when I saw the sign for it. The sign didn't list a distance so presumably it was close, and I was in the thick of a lot of rocks and so I assumed it must have been nearby. I wasn't in a particular rush or anything and decided to detour off the trail to check it out--assuming it didn't take more than 10-15 minutes for me to reach it. It didn't. 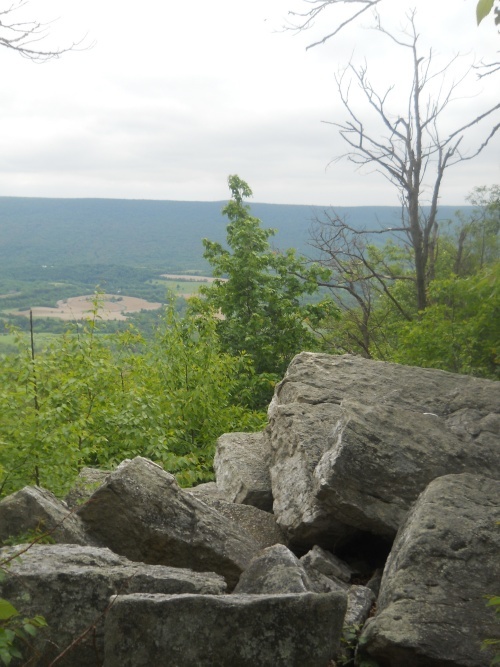 It look less than 5 minutes to reach it, and only because the rocks were quite a scramble and slowed me down! Since I knew nothing about balancing rock--literally, absolutely nothing about this geological feature--I didn't really have any expectations except that there would likely be a large rock precariously balanced on a small point. And that's essentially what it was, but when I found the rock, my jaw dropped open and I said--out loud--"You've got to be $#!^ing kidding me!" The rock was a large one, to be sure, that probably weighed 20 tons or something. 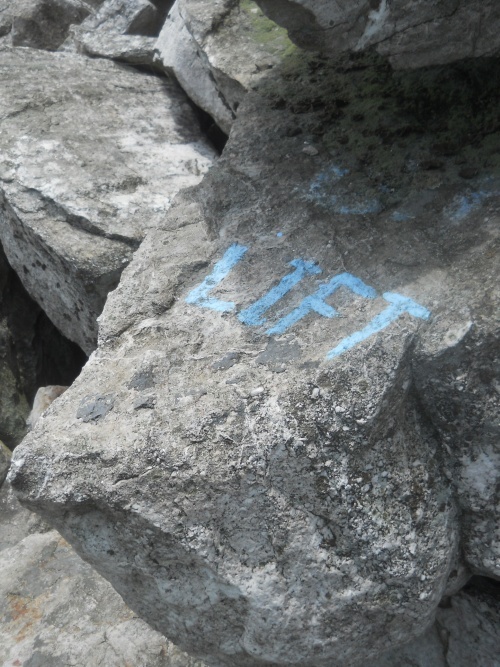 It wasn't particularly huge in the grand scheme of large boulders, but the thing that got my attention was a single word painted onto the edge of the rock: "Lift." Maybe the boulder wasn't a giant in the grand scheme of boulders, but it was clearly far heavier than anything I could lift. It was so large, I'd have doubted it could have been nudged even with a dozen strong people pushing it. But clearly, someone thinks it can be lifted because why would they have written the word on the edge of the rock? I walked over it to, checking it out closer. I expected a dramatic, precariously balanced rock, but this didn't look particularly dramatic. It looked pretty darned solid, in fact. 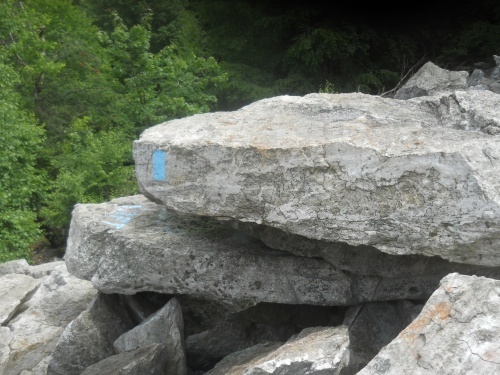 It was long and narrow, which rested on top of another long, narrow slab of rock, which rested on yet another slab of rock, and it was the middle rock that had the word "lift" written on it. This had to be a practical joke. I looked around, half-thinking there were hidden cameras set up somewhere. Surely it's not possible that someone could lift that! But I was here already, so I may as well give it a try. I set down my pack. I didn't know how much effort it would require to "lift" this rock, but I was going to give it all I had. 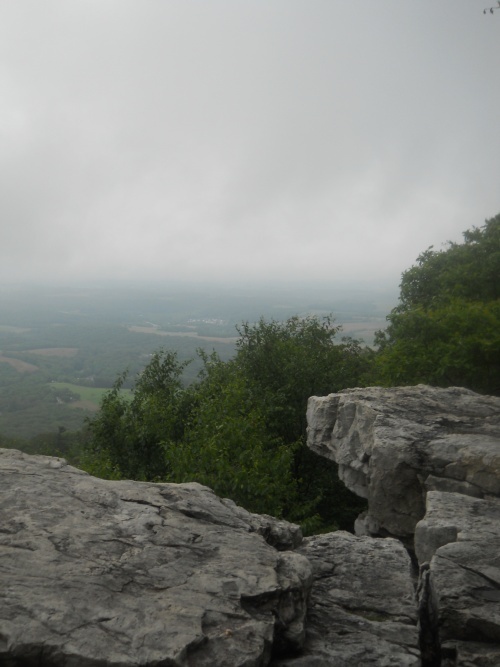 I put my hands under that middle rock and heaved upwards. The rock shifted, coming up about an inch before stopping when the other side of the rock hit the bottom of the slab underneath it. That was it--I wasn't going to lift it anymore than that. It didn't take much effort to shift it that small bit, though. And now I understood what was happening. The middle rock wasn't quite a perfect fit for the slab underneath it, resting on a pivot very close to its center of gravity. 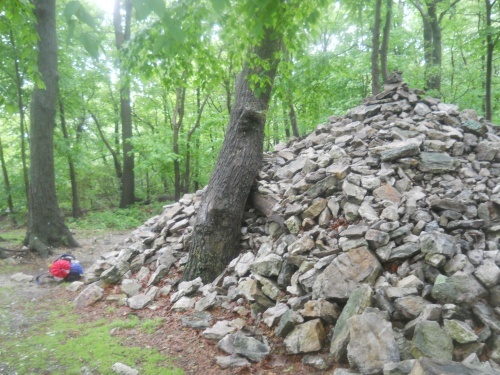 It only had a tiny bit of play before the two slabs would grind against each other and stop the movement, but it's still fairly surprising to realize that a single person could shift those boulders with such little effort. I let go of the rock and the boulder rocked back into its original position. I jiggled it a few more times, marveling at the ability to move such a heavy rock with such little effort. Superman, I thought, would be jealous! I wished he were around so I could get a video of "Superman" moving this giant boulder, but alas, I was by myself. 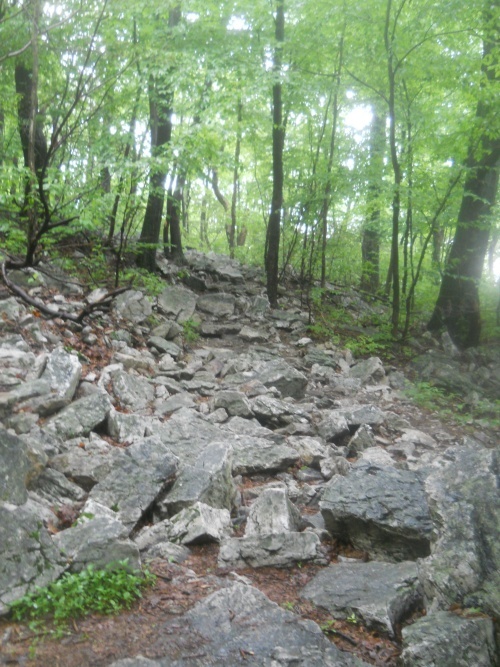 I couldn't take a video and move the rock at the same time, so I took a few photos of the rock and continued onward back to the trail. It was great finally catching up with Heavyweight and Superman again, though. 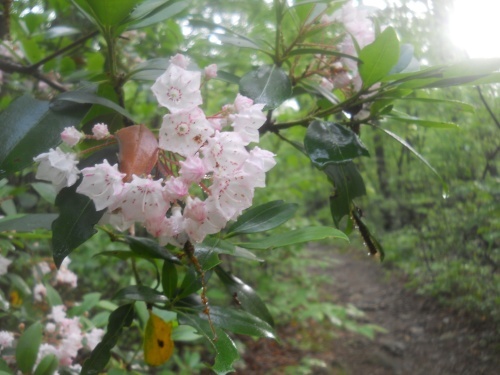 I had missed their company and we swapped war stories about our hike through the rain, trail-rivers, Hawkeye and more. Good times, all around! Things were looking up again! 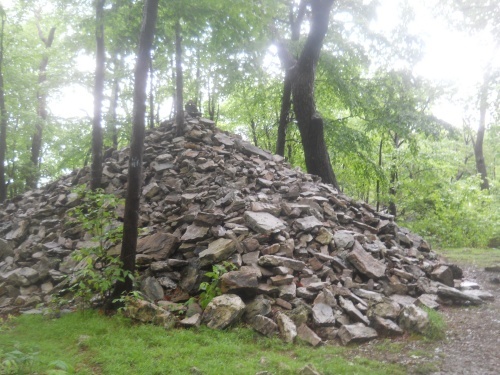 The infamous rocks of Pennsylvania have reared their ugly heads! 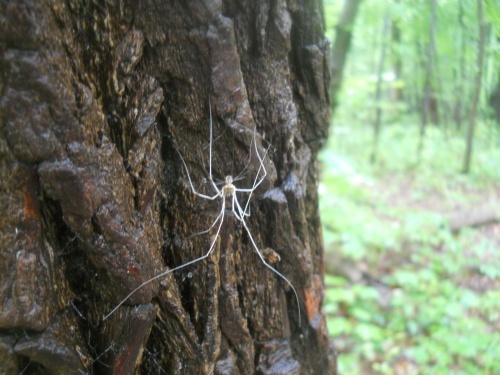 I don't know what this critter is called, but I liked to call him the "ghost spider." 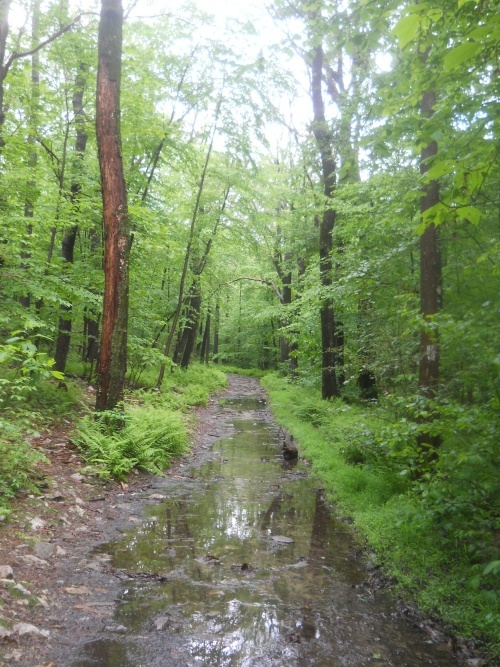 Although the rain had finally stopped, the trails were still drying out! 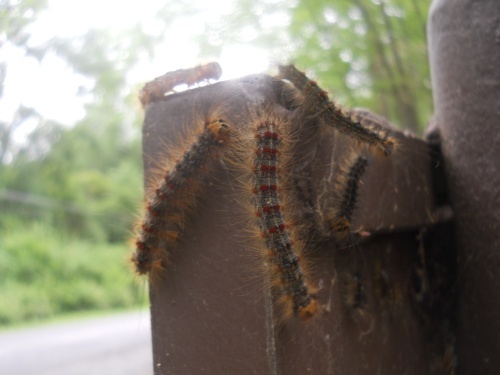 Lest you think the gypsy moth infestation has passed, think again. They're still out in abundance! 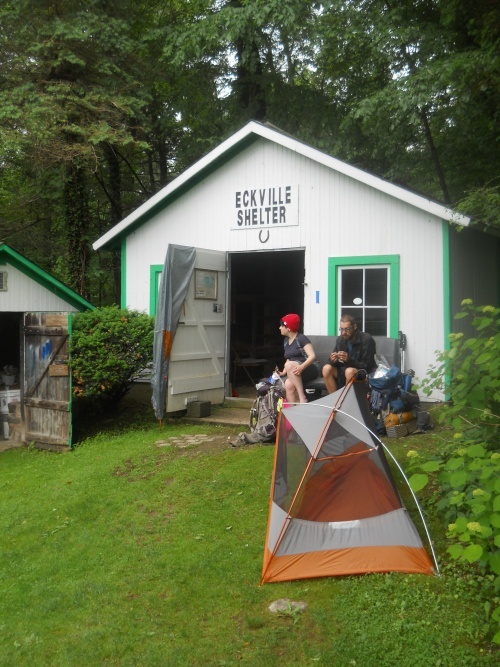 The Eckville Shelter was a nice one--which even included electricity to charge my smartphone again! But I just stopped for a snack break and not to spend the night. 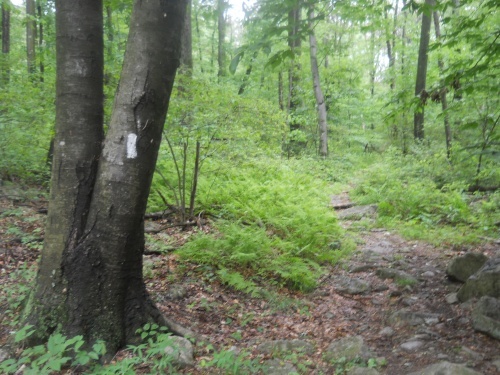 I was curious enough about this sign to follow it off trail, not knowing anything about what I'd find! These are the balancing rocks. See that word "lift" painted in blue on the left? My reaction was, "You've got to be $#!^ing kidding me!" But by golly, it really worked! I could lift it! Near the end of the day, the overcast started to clear and the day brightened! 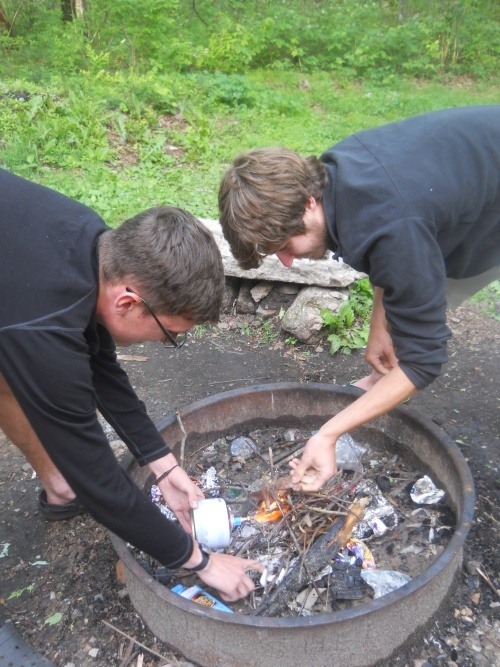 Superman (R) and Heavyweight (L) build a campfire using their stove as a "blowtorch." 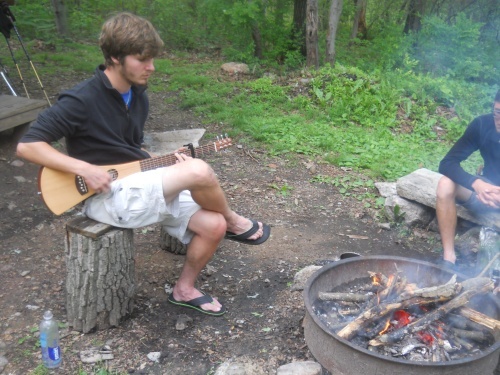 Superman entertains everyone around the campfire with his guitar.